Most businesses in the UK understand the need to have a digital presence and with that, aÂ visibility inÂ Google. Digital Marketing agencies will look at the opportunities in Google for potential customers and build out a paid and organic proposition for a prospect. But this isn’t a dark art and any business ownerÂ has the ability to understand their market themselves. 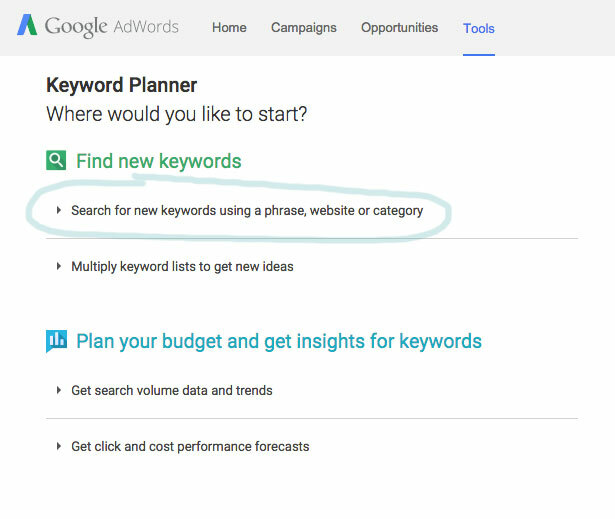 Below is a simple step-by-step process which illustrates how to use the Google’s Keyword Planner tool to review search volumes and opportunities for your services and areas, followed up with a simple method of adding some perspective to the data. If you haven’t already you’re going to need a Google Account, You make one by following the instructions here. We’re going to use an example business that has a local coverage, in this caseÂ a plumbingÂ company based in Leicester. This way we can look at different types of services that relate to a plumber along with a selection of cities and towns related to the target coverage. 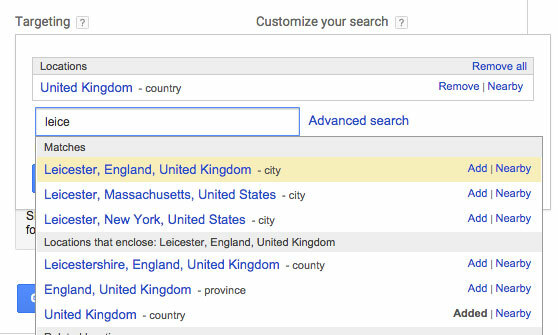 Click the ‘Search for a new keyword using a phrase, website or category’ option. For best results add your products and services into the ‘product or service’ box. Add as many keywords you can think relate to your business. Personally I would ignore the ‘website’ and ‘category’ options and head straight to the ‘Targeting’ option. Use this to add your locations of service or if you operate nationally, leave this set to UK. If you operate locally, remember to remove the UK option before continuing. Once you’re happy with all the products, services and areas click the ‘get ideas’ button. I recommend leaving the other options to their default settings at this point, you can always change these at a later stage. You’ll then see the following screen, this is a default recommendation from Google for Paid search Adgroups and although this can be helpful, what we’re really interested in is the ‘keyword ideas’ tab. Once you click ‘keyword ideas’ you’ll be presented with the average monthly search volume for your specified keywords and areas. This will start to give you the data needed to understand the opportunity in Google. You can see some key information, including Avg. monthly searches, competitionÂ and suggest bid costÂ onÂ Adwords. Already from our example we can start to see which keywords have search volume and may be important to a search campaign. 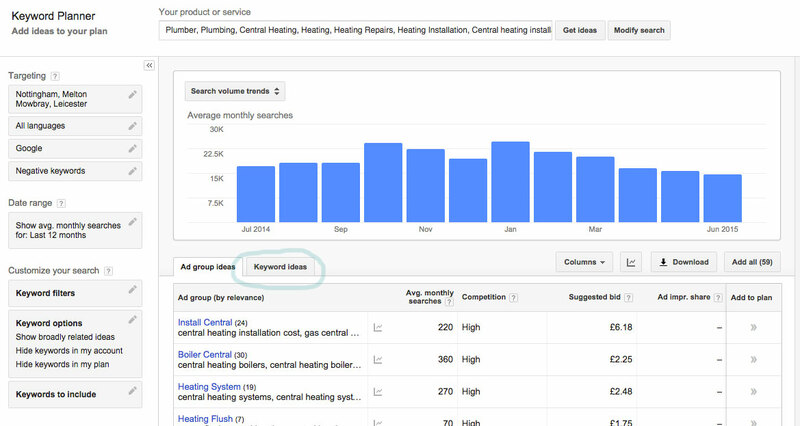 It’s important to note that although a search term like ‘central heating installation’ has a much smaller search volume than ‘plumber’ the user is much more targeted with their search query meaning they may be more inclined to buy or may convert at a higher order value. This data is perfect for starting a discussion with your digital agencies as you can start to find trends, opportunities and search volumes around phrasesÂ relating to your business. Fantastic and simple! However, we can go a level further to be even smarter with ourÂ data by applying a level of business senseÂ to each of the keywords. Once you have a list of keywords I recommend exporting them to an Excel spreadsheet and adding a couple of extra columns, firstly ‘Business value’ and secondly ‘Priority’. You can score both of these out of ten against each keyword. ‘Business value’ is what this type of enquiry means to your business. In our example we know that a full central heating installation could be a higher order value and more desirable than fixing a leak on someones toilet, meaning you might give ‘central heating installation’ a higher ‘Business value’. On the contrary, you might have too many ‘central heating installations’ on at the point you start your search campaign, so decide although the ‘business value’ is high the ‘priority’ is lower as you actually need odd jobs to fill your teams work flow day in day out. In which case you’ll have a higher priority for the more generic terms such as ‘plumbers’ and ‘plumbing’. This shows that something like ‘central heating’ has more value to your business thanÂ the generic phrases, as the search volumes are good combined with a higher business value and priority. Understanding this data allows you to have a great starting point withÂ your digital team to focus their attention at the start of a campaign. If all thats too much, my recommendation would be to use Creare’s DigitalÂ Health Check which will review your sites performance and gives the opportunity for a user to find out search exposure for their industry without having to use the Google interface.